Vessel Voyage 440 named Alboran Mahanga (Majorca) has been produced in 2003. We propose this boat from harbor Palma de Mallorca in the region: Palma De Mallorca. Alboran Mahanga (Majorca) is licensed for 10 persons. Layout of the vessel is 10 (8+2). Voyage 440 Alboran Mahanga (Majorca) is equipped with 6 bedrooms. For guests disposal there are 4 toilettes with showers. You can fill the tank for fuel with 400.00 l l. and in water container it goes even 620.00 l l. With engine 2X40hp Alboran Mahanga (Majorca) can sail really fast. Alboran Mahanga (Majorca) is 13.36 m long and 7.60 meters wide. Depth is 1.35 meters. Check more yachts clicking here: Catamarans Palma de Mallorca. Yacht's equipment involves : Anchor electric windlass, Dinghy, Bimini top, Gps plotter, Autopilot, Radar, Radio / cd player. . Nonrefundable caution is at the level of 2500.00 EUR. Choose our offer and enjoy your holidays on the deck of Alboran Mahanga (Majorca). 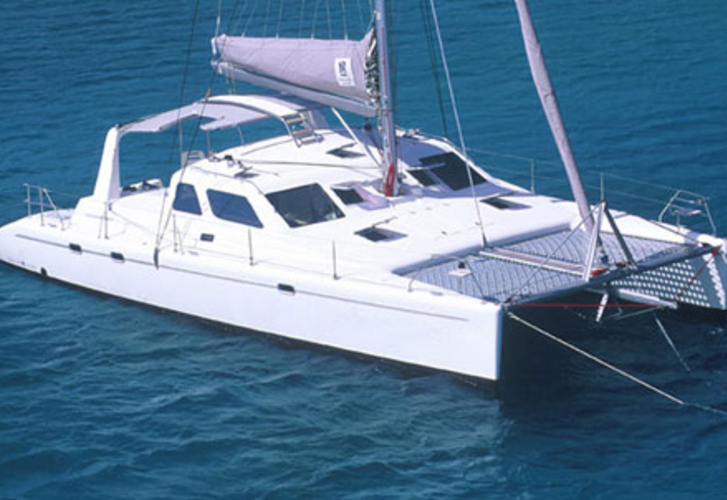 This Voyage 440 from Palma de Mallorca from Balearics Use this site to find in this site: Catamarans Balearics.